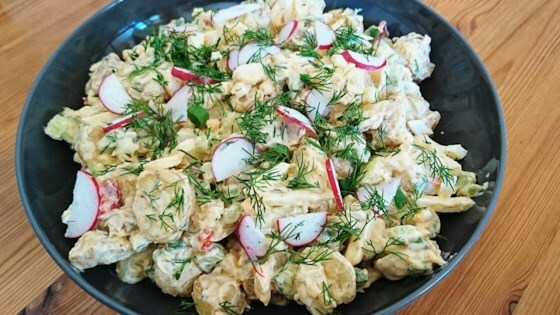 "This is a traditional and easy to make potato salad." Be careful not to use to large of potatoes, or they will not be done. Cut them in half. Boiling time needed to be a bit longer, about 45 minutes. Good taste. This is really, really good! I chopped up a hard-bioled egg in the salad as well, and used a couple of tablespoons of fresh parsley. Will definitely make it again.